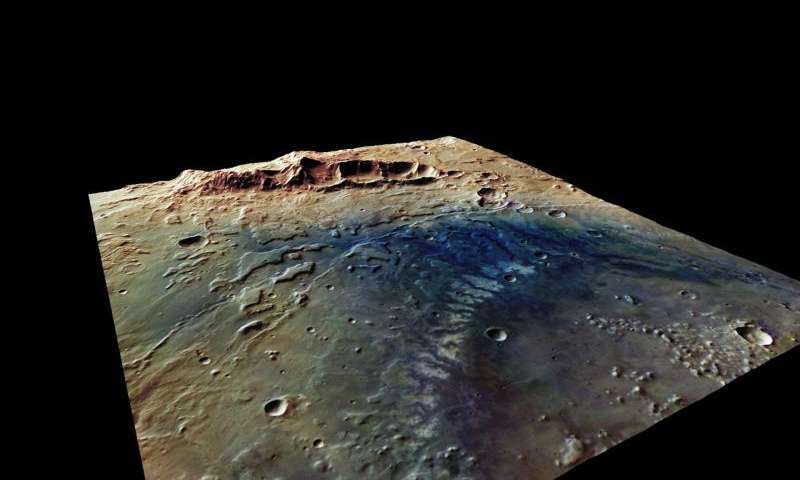 There is a wealth of evidence, collected over the past few decades, that suggests liquid water was abundant in the early history of Mars – one of our nearest and most studied neighbors. However, the size, evolution and duration of standing bodies of water, such as lakes, on Mars’ surface are still a matter of great debate. 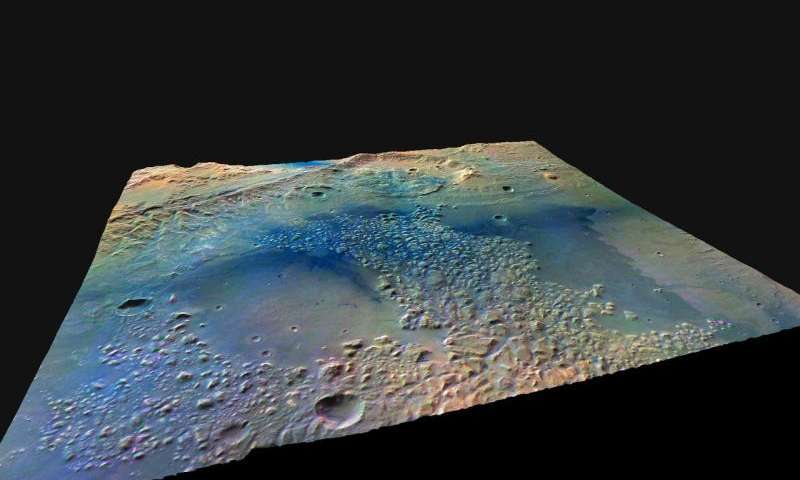 A recent study, using data from several spacecraft operating at Mars, paints a detailed picture of the rise and fall of standing bodies of water in a region of Mars which once hosted one of its largest lakes. Mars’ surface is speckled with basins thought to have once hosted extensive lakes and rivers. The basins left behind by these long since dried-up bodies of water capture an important record of the geological and environmental conditions endured by the regions and make them prime candidates for exploration and study. 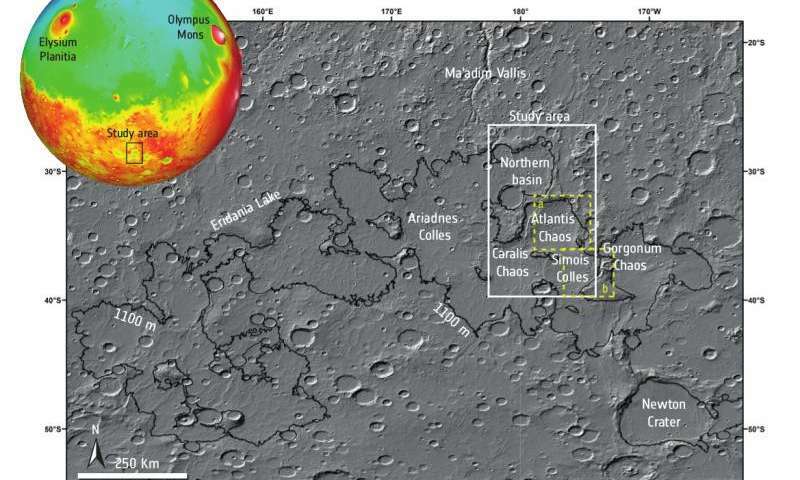 A recent paper, published in the Journal of Geophysical Research-Planets, describes a study of an area of Mars’ surface known as the Terra Sirenum region, which is thought to have played host to one of the largest lakes on Mars. The body of water, known as the Eridania Lake, once covered an area of over a million square kilometers shown below before dividing into smaller isolated lakes and eventually disappearing altogether along with the rest of the water on the planet. This study focusses on the geological events that occurred before, during and after the transformation of the gargantuan Eridania Lake into its hypothesised smaller lakes by looking closely at four ancient basins. Each of the four basins – Atlantis Chaos, Simois Colles, Caralis Chaos and an unnamed basin referred to in the study as the Northern Basin – hosted its own individual lake following the fragmentation of the Eridania Lake. By combining data from the High Resolution Stereo Camera (HRSC) on ESA’s Mars Express with images from both the High Resolution Imaging Science Experiment (HiRISE) and Context Camera (CTX) on NASA’s Mars Reconnaissance Orbiter (MRO) the team have built up a detailed geological map for the region and accurately modelled the ages of the mapped units. This, complimented by data from MRO’s mineral-finding Compact Reconnaissance Imaging Spectrometer (CRISM), used to characterise the distribution and nature of materials in the area, has enabled the team to interpret the geological history of the region, creating a detailed time frame of its formation and suggesting the most likely mechanisms that led to it. Having mapped the area and characterised the different layers of material the team are able to present a theory of how the area evolved. The oldest geological terrain – dating back to Mars’ Noachian period which began around 4 billion years ago – is on the highlands that surround the basins. On top of this ancient, cratered surface, relentlessly dented by a period of extreme asteroid and meteorite impact, can be seen a younger layer of material which was deposited through the air as dust and ash. “This younger layer of material sits on the uplands atop the older material, moulded into flat-topped and steep-flanked structures known as Mesas,” explains Ernst Hauber from DLR who worked on the geological observation, mapping, and interpretation in the study. In the basins themselves, rather than having been sliced into Mesas by wind and water movement, the team found that this material had cracked and eroded to form dramatic knobs of material that extend up to 600 metres from the basin floors. The team was able to create a timeline for these events and propose the mechanisms that caused them by studying the morphology, stratigraphy and the mineralogy of the material in the region. “Through our study we were able to investigate the presence of phyllosilicate minerals in the pillars of material, as well as in the smooth material on the floors and rims of the basins. These minerals are indicative of the past presence of water and provide further information on the environmental conditions under which the material formed,” explains co-author Laetitia Le Deit from the LPG at the University of Nantes, France, expert in CRISM data processing and mineralogical analysis. In the Northern Basin, the team also uncovered clues to the final days of the Eridania Lake – and the lakes that followed. Within several shallow depressions in the basin the phyllosilicate-rich material is partly encrusted with salts that formed as water from rains, snow or ice melt filled the depressions and then evaporated during subsequent dry periods – a process likely to have taken place either at the end of the lakes’ existence, or even later when a reoccurrence of liquid water filled the smaller depressions in the area. The last piece of the puzzle are the two layers of material identified in the study that are thought to have formed early in the Amazonian period, the geological time frame in which Mars currently finds itself. Both were deposited when the basins were completely dry and provide strong evidence that the smaller lakes that followed the Eridania Lake’s demise were wiped away before the Amazonian period began.